PULSONIC ultrasonic anemometer was developed to provide high quality wind measurement in speed and direction. An ultrasonic anemometer measures the wind speed and direction by using the duration time of the ultrasound waves into the air. Thanks to PULSONIC's Low Power Technology, this Ultrasonic Anemometer can be powered entirely by solar energy. The consumption rate for the ALIZIA 380 is astonishingly low (average consumption level is equal to 7mA@12V). With this innovative sensor, wind speed and direction are accurately measured. The ALIZIA 380 is typically used for airports; in different industries for climatic measurements and even for isolated sites. The ALIZIA 380 is a no-moving-parts flawless wind sensor which can be used in extreme environments thank to a robust and incredibly sturdy stainless-steel housing (IP65 rated). The consumption rate for the ALIZIA 380 is astonishingly low. Average consumption level is only 7mA@12V! It's a perfect sensor for low power applications when the stable power supply is not available. 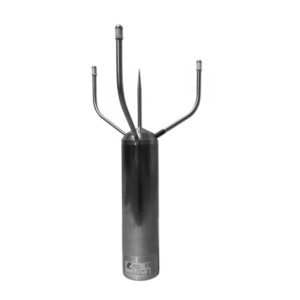 Thanks to the robust stainless-steel housing this solution can be installed in various tough conditions, like near the sea shore or in high altitude moutains. Compare to 3-cup anemometer or wind vane there is no bearing wheels so no more preventive maintenance is needed to change it.